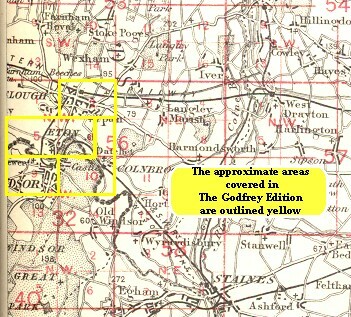 This detailed map covers the still growing town of Slough, which had developed from a village after the opening of the GWR. Features on the map include the railway with station, engine shed and junctions towards Windsor; Royal Hotel, North Star Hotel, Gotha Iron Works, High Street, William Street, Windsor Road, Mackenzie Street, St Mary's church, Eton Union Workhouse, Royal Nurseries. Coverage extends south to Victoria Terrace and east to Aldin House or St Bernards Convent and a small portion of the new development, Langley New Town. The Slough entry from Bennett's Business Directory is on the reverse. The map links up with Bucks Sheet 56.05 Eton and Berks Sheet 32.10 Windsor to the south. This index map shows how they link up.